Next on the agenda was to do the baseboard moldings, using 1/4 round molding to bridge the gaps between the new floors and the original baseboards, as well as to add more molding to the living room baseboards to give them more character. After that was to be the stairs. After much deliberation it was decided that those things will be done in August, when the kids are home and can help. Renting a miter saw from Home Depot for 24 hours is significantly less expensive than buying one, so the goal is to rent a saw and get all the stairs, risers, and molding cut within 24 hours. Working quickly will be easier with more hands on deck plus Adam and Kaden are old enough to help with this stuff and will benefit from learning how to do these projects. So August it is. After making that decision I was looking at a pretty vase of yellow flowers (given to me on my birthday almost a month ago) and thinking how nicely the yellow would pop with white cabinets behind them. And the next "Easy Weekend Project" was born. Here are a few before pictures. I love these, not only are the cabinets the way they are but the kitchen is a huge mess. Perfect before pictures. 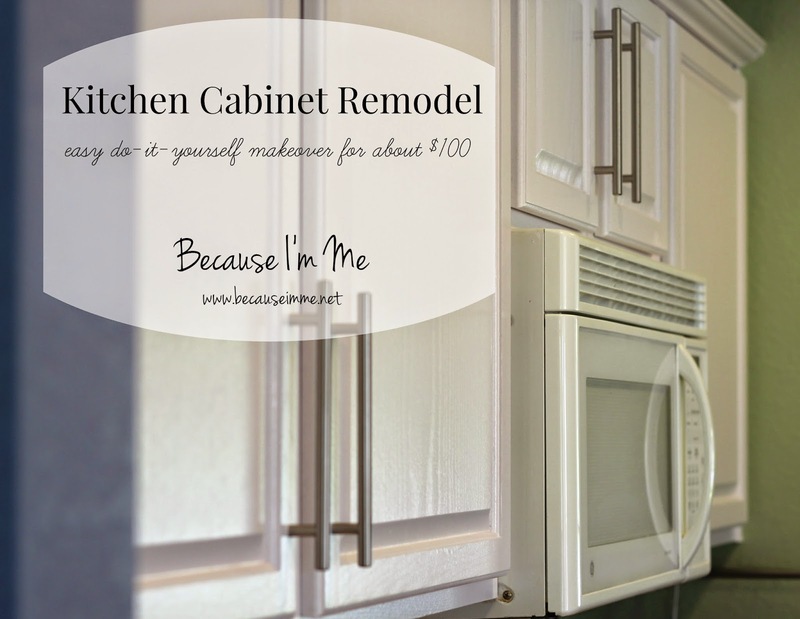 All the cabinets doors were numbered and taken down, and the drawers emptied and removed. The above photos were printed out and each door numbered, corresponding to the numbers attached to the tdoors. After emptying everything out of the cabinets all the doors, drawers, and cabinets were sanded to remove the sheen. Just a really lite sanding to give the primer and paint something to stick to. They were then wiped clean with a damp cloth. Then everything was primed. I used one coat of primer (Zinsser, swear by it), but wish I'd used two. I opted to not paint the inside of the doors, knowing I can go back and do those later if I want to. Both the priming and painting was done with a 3" roller - I took a regular roller and used an electric carving knife to cut it into thirds, pulled off the extra fuzz, and slid it onto the 3" roller frame, and a small foam brush. After the primer dried everything was painted with three coats of Behr Innocent White semi-gloss paint from Home Depot. Yes, three coats for good even coverage ... really should have used two coats of primer. I did sand gently after the primer and first coat of paint, just to be sure everything was nice and smooth. I really didn't want the kitchen to look like it'd just been painted by a preschooler. After 24 hours I cleaned out the cabinets (mostly to get the tile bits out of them ... seriously, that stuff is everywhere), refilled them, and reattached the door fronts. I wanted to wait a while before doing this step so that nothing would be tacky and the paint wouldn't peel off. I ran into problems with that in the camper and didn't want it in the house. 24 hours worked very well. The last step was to install the hardware. We didn't have any hardware previously, but I knew with boys I needed some for these white cabinets, plus they just didn't look finished without 'something'. I purchased long stainless steel bar pulls from D. Lawless Hardware. These beauties were just $2.21 each ... unbelievable price (and they're beautiful, well worth it). I used this video tutorial to create a template for the pulls, it made this project so easy. I couldn't find a drawer pull that I liked, I didn't want knobs and didn't want to spend an arm and a leg for something else. And then I thought of using cleats, which sounded awfully "themey" but I only needed four and they're spread throughout the kitchen, so I decided it was worth a try. I purchased stainless steel cleats through Amazon at $7.99 for two, a little pricier than the steel bars, but still not bad at all. The cleats install differently than traditional drawer pulls, but with a bit of measuring, marking, leveling, drilling, and hand screwing they went in fine (the first ones didn't go in fine ... it got much easier with practice). Total cost: $103.00 ... way less than new cabinets or the cost to pay someone else to refinish them, and it would have been way less if I'd purchased less paint and primer. This was a solid two day project, with another two hours to install the hardware. Not bad at all, but a little longer than I'd expected (someday I'll learn). I'm in love with my kitchen. While I have an open floor plan house the kitchen is right in the middle and is a bit of a dark hole. Not so much anymore (still a little dark, making pictures hard). It's bright and fresh and cheery. I can't help but smile whenever I look at it. Only regret ... that I didn't do this years ago! Love it!! We bought a foreclosure home 2 years ago and I can't tell you how I hated the kitchen but we didn't have much money to fix it. I had orange counters and dark old cabinets. I painted my counters and the cabinets and man oh man I am in love with it. It just took some energy and time and it looks so much better than before. Yours looks great! Good job!